There's no denying the popularity of the LEGO video game franchise. They're cute, witty and with pick-up-and-play controls they perfect games for the whole family. If you have any young buccaneers in your home you might want to consider picking up the Nintendo 3DS version, which packs all the fun of its console counterpart, but also adds some pretty neat 3DS exclusive features. Let's take a look at what this game has to offer. 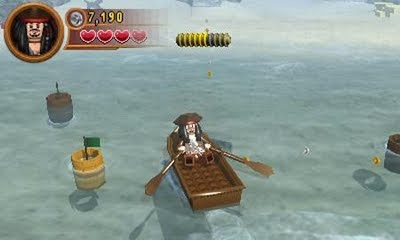 The basics of the game remain close to what's seen on home version, including collecting studs, red bricks, pirate doubloons, and ships in a bottle. Each character specializes in a certain class with specific abilities, such as the blacksmith who can hammer blue bricks, the dual-sword swashbuckler that can scale vertical wall, and our famous wobbly pirate Jack Sparrow who can detect buried treasure with his trust Compass. That brings me to the major change with the 3DS version, the 3D visual environments. Even since the Nintendo 3DS was introduced I was looking for a game that is actually more playable with the 3D effects, and I've finally found it. One of the dreadful aspects of previous LEGO games has been the platforming sections which often leads to unintentional deaths due to miscalculating the distance between platforms. Well on the 3DS version spotting the depth is intuitive and the platforming sections can be completed more precisely with little to no accidental deaths. Even better, there are hidden areas scattered around each area and the 3D effects lets you easily detect hidden entrances or items lying behind obstacles just off the beaten path. The 3DS version also includes a cool Pirate Duel multiplayer mode with nearby owners of the game using the portable device's StreetPass feature. 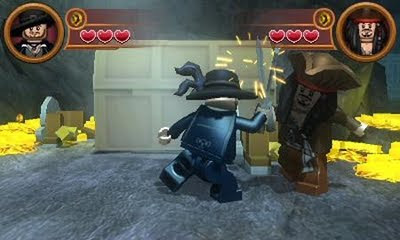 Players select a series of attacks and blocks for their LEGO Pirate and when you encounter another player with StreetPass enabled a battle is initiated. Winning battles nets you experience points and your Pirate can move up ranks which unlocks a ton of bonuses ranging from extra health, new moves and even new characters. 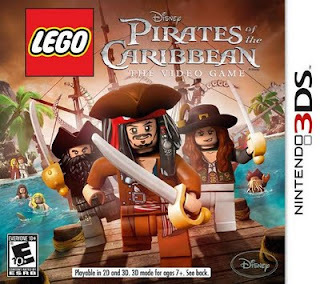 Everything that made the home version fun is retained on the Nintendo 3DS version, and if you're a fan of the Pirates of Caribbean franchise you won't want to miss this. While the game is a tiny bit scaled back, the added 3D effects and Pirate Duel mode makes this the definitive version in my opinion. Not only is it everything you'd want in a LEGO game wrapped into one, but best of all you can take the game with you wherever you go.